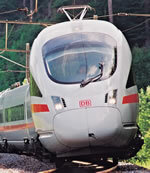 Rail Canterbury are able to arrange all of your european rail ticket and reservations. Thanks to years of experience we can advise you on the best prices and itineraries for your european travel needs. With direct access to most European country’s reservation and ticketing systems so we are able to organise your travel to almost any destination in Mainland Europe. You may know exactly where you would like to go, and how to get there, in which case call on us and we can arrange it all for you. Equally, however, you may need a little help and so, with a few suggestions and the whole of the European Rail network at your disposal, we will be able to tailor make a holiday just for you. If you would like to venture further than just Paris or Brussels, please contact us and we will be pleased to offer our assistance. Many further destinations can now be reached in a day. For example the French Riviera, Northern Italy, most of Germany, Spain and Switzerland are all less than 12 hours travelling time away from London, and some a lot less than that. If you want to travel even further afield then modern night trains may be for you. Whatever you want to do and wherever you want to go, let us help you with it.